Home HEALTH This is why some people have a tiny hole above their ears. This is why some people have a tiny hole above their ears. When we think of a rare trait, we tend to go big and imagine the kinds of attributes that might make people stop and stare. Many times, though, an unusual trait is hiding in plain sight — it’s just so small that most people don’t even realise it. In fact, you might not even know that you have it yourself. One such feature is called the preauricular sinus. 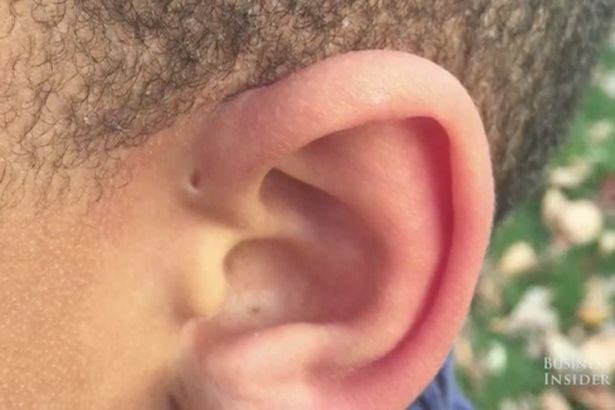 From a distance, you might just think it was a simple birthmark, or possibly a piercing without any jewelry in it (and in a place where you’d never be able to use an earring back). About 4-10% of people in Africa are born with tiny, barely visible holes above their ears called a preauricular sinus. This is basically some malformation 'nodules, dents, or dimples' that are exposed anywhere around the external ear – specifically, where the 'face' and the ear cartilage meet. They look like holes, but often don’t go all the way through. They can just be a dimple, a dent, or even a raised nodule, in which case it’s called a preauricular cyst. They’re harmless, although they can sometimes trap bacteria and get a little infected. But with proper care, any infection will usually clear right up. Surgery can be used to correct a preauricular cyst that causes repeated issues. The preauricular sinus is, technically, a hereditary birth defect that was first documented by a scientist called Van Heusinger in 1864. Usually they are found on one side, but up to 50% of people have them on both. The holes appear during early fetal development, are hereditary and form in utero with the rest of the baby. It’s technically a “defect,” but most people think they are sort of cute! It is believed that the holes form as a result of a slight defect in the pharynx. Evolutionary biologist, Neil Shubin, theorised they could be an ‘evolutionary remnant of fish gills’. In cultures where they’re more prevalent, there are even some superstitions about them. For example, in Ethiopia, people believe that they attract wealth.